"Your family will love this dish made with a creamy butternut squash sauce, rigatoni pasta, and Italian cheeses and baked to perfection." 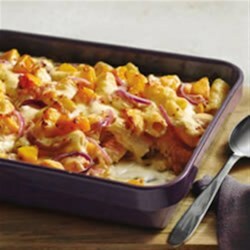 Combine first 4 ingredients in 13x9-inch baking dish sprayed with cooking spray. Bake 30 to 40 min. or until squash is tender. Meanwhile, cook pasta as directed on package, omitting salt. Drain pasta, reserving 1/3 cup cooking water. Add to squash mixture with Cooking Creme, reserved water and 1 cup shredded cheese; mix lightly. Top with remaining shredded cheese. Garnish with 1 Tbsp. chopped fresh basil just before serving. Thoroughly drain cooked pasta because excess water clinging to the pasta will dilute any sauce that you add. Nutrition Information Per Serving: 320 calories, 14g total fat, 7g saturated fat, 30mg cholesterol, 390mg sodium, 36g carbohydrate, 4g dietary fibre, 6g sugars, 14g protein, 120%DV vitamin A, 25%DV vitamin C, 25%DV calcium, 10%DV iron. Great recipe. I had leftover squash and this was the perfect way to use it up. Did not have three cheese so used regular cream cheese.